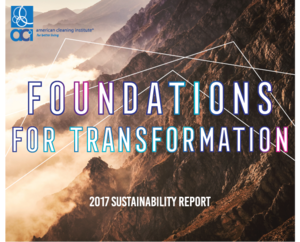 The American Cleaning Institute’s (ACI) fourth Sustainability Report, “Foundations for Transformation,” showcases the steps the cleaning product supply chain is taking to address the industry’s core material issues. The 2017 Report highlights the progress made by companies throughout the cleaning product supply chain to decrease the industry’s environmental footprint over the last two years. “ACI and its members are building upon a legacy of leadership by evolving our sustainability strategy to reflect the critical issues identified through the first-ever materiality assessment for the industry, which debuted in our 2015 report,” said Melissa Hockstad, ACI’s new President and CEO. “By weaving these critical issues into the fabric of our sustainability strategy and reflecting honestly on our progress to date, we hope to set the stage for leadership into the future. “While we are very proud of the progress individual companies are making on the priority material issues, as an industry we recognize that we have much farther to go. “We need to see greater engagement and participation from companies large and small in the transactions that make up the sustainability fabric of our supply chain. Now more than ever, we call upon the industry to consider bold collective actions that can drive momentum toward sustainable development. Since its inception, ACI’s Sustainability Metrics Program has been tracking industry performance in categories including energy, water, waste and climate change/greenhouse gases, to showcase where member companies are doing well, and to highlight the areas in need of attention. “ACI plans to continue to delve into the factors that may affect the metrics data, as we work to align the Metrics Program with member companies’ most material sustainability issues. We know our member companies are setting targets and making progress, which we expect to see in our future data,” said ACI’s Melissa Hockstad. Church & Dwight Company, Inc. The 2017 Sustainability Report includes profiles of more than 30 of ACI’s member companies, outlining their sustainability efforts over the last two years. The report also features an updated summary of ACI’s social and environmental sustainability programs, as well as details on ACI’s scientific and research programs. The American Cleaning Institute® (ACI) is the Home of the U.S. Cleaning Products Industry® and represents the $30 billion U.S. cleaning products market. ACI members include the formulators of soaps, detergents, and general cleaning products used in household, commercial, industrial and institutional settings; companies that supply ingredients and finished packaging for these products; and oleochemical producers. ACI (www.cleaninginstitute.org) and its members are dedicated to improving health and the quality of life through sustainable cleaning products and practices.